Alibaba arrived soon after. He had brought the kafan (shroud) with him. Together, they washed Qasim's stitched body in warm water (Gusl). Then donning it the shroud (kafan), they lay the corpse upon a bier, ready for the funeral procession and burial. When the neighbors started arriving, Marjina went to the mosque and informed the Imam that a Janaza (funeral) awaited in Qasim's household. She requested him to come and read the prayers for the dead. The Imam went back with her and said the funeral prayers. Four mourners picked up the four corners of the bier and bore it on their shoulders. The Janaza proceeded with the Imam towards the burial grounds. 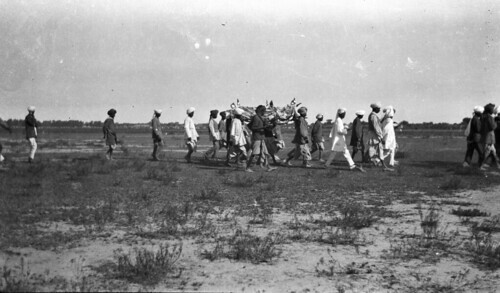 Mourners took turns at carrying the bier, rotating and relieving the coffin bearers until they arrived at the cemetery. Here they buried Qasim, and went their ways. The women folk, as was customary, gathered together in Qasim's house and sat an hour with his widow comforting and condoling her. No one suspected anything. There wasn't any reason to. The business of Death was over, The business of Life carried on. It was business as usual. While the dead rested, the live returned to their chores. "Is this how it is done in Islam?" asked Josh. "Sharia," Rosh answered, "which is Islamic religious law, calls for burial of the body after a simple ritual involving bathing and shrouding the body. The Muslims of the community then gather to offer their collective prayers for the forgiveness of the dead. This prayer is called Salat al-Janazah (Janazah prayer)." "Hindus also bathe and shroud the body, and prayers follow the funeral procession, but they then cremate their dead bodies instead of burying them. Cremation of the body is forbidden in Islam." "Why wash a dead body," Josh asked, "if you are going to bury or burn it anyway?" "Well, you clean yourself when you reach somewhere after a long journey, don't you?" Rosh asked in reply. "Similarly a body arrives at the junction of death after the long journey of life." "But the dead can't wash themselves. So commonly, adult members of the immediate family and of the same gender as the deceased, wash the dead body. In most cultures, a dead body needs to be treated with respect and dignity. How a culture treats its dead, tells you a lot about that culture." "In most cultures, a dead human body is not considered just a piece of meat, though literally, it is just that from a scientific point of view. So it is washed and clothed, even though, as you say, in the end it will be burned or buried anyway." "Pa, are there strict rules about a kafan too?" Hosh asked. "Most cultures generally wrap their corpses in a simple plain cloth," Rosh answered, "to respect the dignity and privacy of the deceased. The specifics of this ritual, including the material, style, and color of the cloth, may vary across regions and religions." "Sharia says that the shroud should be simple and modest. So, Muslims generally use white cotton cloth to serve as the shroud. Hindus have traditionally used white or saffron cotton cloths. A poor Muslim or Hindu though, will perhaps be grateful to use any clean cloth they could get, I guess." "A full and formal dress code has now become common in Christian and European cultures to farewell their dead." "But Josh's question is an interesting one. I don't think that either the dead or their body cares too much either way if they are washed or not before their final rites. The living care about it though, and so it is done. Even some animals understand, respect and pay homage to death." "Are you guiding them," Isha raised an eyebrow, "or misguiding them?" "I am just speculating on why the rites are what they are," Rosh answered, "and confessing, I guess, that sometimes our kids can ask questions that we never asked all our lives. We should have." "Generally, it is considered impolite to question these things. What rational answers can you expect from orthodoxy anyway? They never ever questioned either, they just followed. Perhaps that's why asking such questions is frowned upon. Because neither do they know, nor do they want to confess their ignorance." "You are presuming too much," Isha protested. "Paa! Our story," Hosh interrupted a possible domestic. "What did Ali Baba do then?" "Ali Baba observed all the mourning rituals for the death of his brother to the letter," Rosh continued with the Arabian Nights tale, "and remained in his house ceremonially grieving for the full mourning period." "How long should someone grieve their brother's death according to Sharia?" Isha asked. "Generally, for three days," Rosh replied. "Islamic mourning is observed by increased devotion, receiving visitors and condolences, and avoiding decorative clothing and jewelry." "Even in a funeral procession, Islam expects that Muslims show acceptance of Allah's will when their relative dies. Grief at the death of a beloved person is normal, and weeping for the dead by males or females is perfectly acceptable in Islam." "But all acts and speech that show dissatisfaction with Allah's verdict such as undignified crying and shrieking, loud wailing, beating the chest and cheeks, tearing hair or clothes, breaking objects, scratching faces etc. are frowned upon, even though much latitude is granted in practice." "As fatigue and emotion can adversely affect ones' behavior, such behaviour is rarely censured." "Different societies have different customs and traditions associated with life as well as death. Ali Baba's customs allowed a man to have more than one wife. It was also not unusual in the Kingdom of Persia at the time that when a husband died, his brother married his widow." "So, four lunar months and 10 days after Qasim's funeral, when her Iddah ended, Ali Baba openly married Qasim's widow, and took over all the property and slaves belonging to his deceased brother." "He appointed Qasim's eldest son, who had been learning trading from his late father, in-charge of Qasim's shop and delegated to him, his powers to carry on the family business."